“Grand Theft Auto V” has not yet come out with its much-anticipated Heists DLC, but Rockstar on Tuesday instead came out with the “I’m Not a Hipster” update. According to reports, the Heists patch is believed to come out in a few days. Early reports said the update would be out in the “spring,” and summer officially starts in a couple of days. 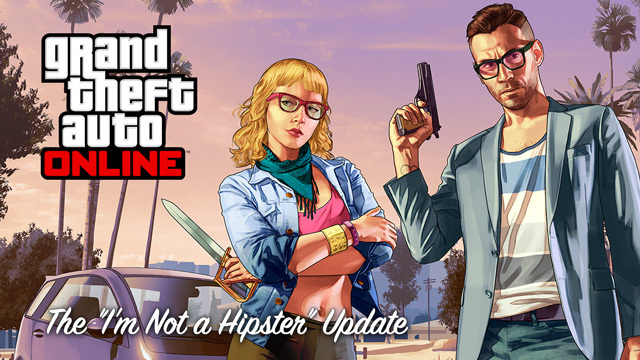 Rockstar on Tuesday issued a press release about the “Hipster” update. “Express your incredible individualism and stand out from the herd with The post ironic, artisanal, organic, entirely independent, 100% re-claimed ‘I’m Not a Hipster’ Update now available for Grand Theft Auto Online. This new content update features new retro print tees, skinny jeans, hairstyles, tattoos, animal masks and more, as well as additional enhancements to general gameplay to ensure the world is constantly evolving,” the release says. The update has a seven new vehicles, which focus on “classic nostalgia” cars and “environmentally conscious” vehicles. Also, the game introduced a Vintage Pistol and an Antique Cavalry Dagger. “Along with today’s update, gear up for 12 new Jobs across an assortment of game modes, including Races that provide showcase opportunities for these new retro rides, a Deathmatch in Puerta Del Sol, two new Captures and more. There are also three new Gang Attacks in Chumash, East Vinewood and Mirror Park,” Rockstar also wrote. The update also introduced a few tweaks to the Online gameplay, including 10 new cars being added to the southernsanandreassuperautos.com website, black window tint, new player celebrations, and it made some fixes. “This update also includes a host of other adjustments, game tuning and exploit fixes,” said Rockstar. A support thread said that a longstanding problem that allowed players to be charged insurance if their vehicle was destroyed by another player who doesn’t have enough GTA$ is fixed. The support thread can be accessed here. Fixed an exploit where players were able to maximize their stats illegitimately. Fixed an exploit where players could launch cars into the air by driving into gates. Fixed several exploits where players were able to duplicate Personal Vehicles. Fixed an exploit where a certain vehicle was invulnerable to bullets. Fixed an exploit where players could attack an Armored Truck and gain cash without gaining a wanted level. Fixed an exploit where players could repeat the same Bounty multiple times. Fixed several exploits where players were able to make themselves invisible. Fixed an exploit where players were able to add any vehicle to their Garage. Fixed an exploit where players could bring cars from Single Player to Online.